I pulled this one mid last week to take along and work on during lunch. I just can't seem to get in to finishing the Bent Creek pieces I have going so instead of just not stitching I started this. I opted to not do the knots that are supposed to make up the bee, he is simply cross stitch. If you want to see it with knots look at Melanie's blog. She just completed the matching scissor fob for an exchange. 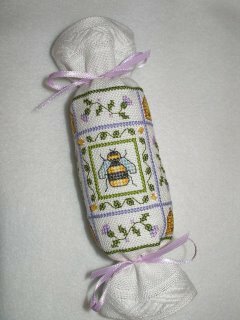 Your bee needleroll is so sweet! I think it looks great without the knots.